Today I’m (re)visiting Sustainable Bungay’s Give and Grow seedling and plant swap which we held in Bungay library courtyard last Sunday. 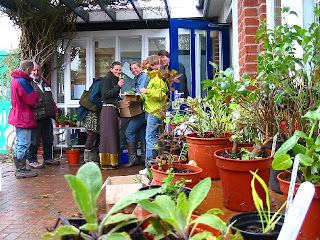 The place was transformed inside and out with a constant lively buzz as people gathered, swapped plants and talked about everything from beekeeping to heritage bean varieties – in spite of the rain and the cold. We’d all been patiently (very patiently this year) growing our seeds for allotment and garden in homemade newspaper pots, toilet rolls and even ordinary pots. The tables were laden with vibrant healthy lettuces, currants of all colours, tree saplings, cosmos, mints, aloe vera, grasses, lemon balm, foxgloves, snowdrop bulbs, wild flower seeds, seed potatoes, cucumbers, the list goes on. And you had to be pretty quick as plants swapped hands even before they got on the tables. Especially the sturdy tomatoes which several people said they’d been having difficulty growing so far. By the way, don’t be misled by these photos into thinking only a few people came. I kept getting into plant conversations with people and forgetting to get the camera out! Here I am with Daphne, Josiah and Nick discussing the merits of ‘Totem’ dwarf bush tomatoes. Inside the library Gemma had set up a table of the homebaked cakes and biscuits from the cafe she runs in a local garden centre. (She also gave me an amazing chocolate cake for my birthday). When the top of the huge tea flask got stuck and seemed set to stay that way, I turned half jokingly to David, who is a craftsman and maker and said, ‘have you got some tools round your belt to fix this?’ Actually he had, and immediately produced an impressive looking penknife he never goes out without. We laughed and I turned away to talk to someone else. Two minutes later he handed the fixed flask back to me. Then he showed me how he had done it and I can now fix seemingly irreparable tops of hot water flasks. Reskilling on the spur of the moment! And everyone could have a hot drink. People are always talking about community in Transition and suddenly I realised: here it was! parents reading books to their children, conversations about what we might do for the honeybee and Elinor (who runs Bungay Community Bees with Gemma) said she loved the look of the datura I’d brought along, but maybe she’d wait till she was about fifty and the kids were grown before she had one at home. As we left, Kristian, library manager and fellow plant lover, gave me a bottle of his delicious home-pressed apple juice – another birthday gift! (Mark Watson/This Low Carbon Life). Plant Swap on Saturday 15th May at the Playhouse.